Normally I'd do 2 salads for this article, but as a big lover of Greek Salad, I have decided not to mess with perfection. As Nia Vardalos' father character points out in the film My Big Fat Greek Wedding, there are a lot of GREAT things the Greeks have come up with. I don't know if the Greeks came up with Greek Salad or if it just got the name because it's made of popular Greek ingredients; either way, it's a great salad with only a few elements consisting primarily of cucumbers, tomatoes, feta cheese, onion, and if you like 'em, olives. Leave out the feta, onions, and olives and you've got Israeli Salad. Greek Salad makes a tasty side dish, or you can pair it with a good hunk of bread or top it with grilled meat and enjoy it as a meal. If assembled correctly, it also makes a refreshing crowd pleaser at parties, particularly BBQs when you need something light and refreshing to cut through all the heavy grilled protein (I say 'protein' because I know not everyone eats meat). 1 English Cucumber - You know those giant cucumbers you see covered in a sleeve of plastic wrap in fruit and grocery stores? Those are English cucumbers. I like them because I find them more refreshing than the warty, tough skinned little guys you also find in the produce section. IF it's summertime - 1 or 2 Fresh tomatoes, rinsed, cut into 1/4s or finely chopped depending on personal taste OR FOR ANY OTHER TIME OF YEAR - 1 basket or small box of Cherry or Grape Tomatoes - rinsed - I like Cherry and Grape tomatoes because unlike other types of tomatoes that tend to get mealy in texture when the cold weather hits, they stay juicy and sweet year-round. Feta Cheese - Feta is a white solid cheese kept in brine that is usually made of goat's milk, though there are varieties made with cow's. I find feta is best bought at the grocery cheese counter (if your store has one) or in small fruit stores or at ethnic grocers, as they tend to have different types like Greek, Bulgarian, and Canadian, and they sell by weight and size rather than a lump sum for small, pathetic looking bricks. Greek feta, while delicious and creamy, is extremely salty. Bulgarian feta is slightly less salty, but it also tends to be dry and less creamy. I find Canadian feta to be the perfect balance of salt and creaminess, but my advice is to try a few varieties of feta and choose the one you like. Many a cheese shop and counter will let you taste the cheese before you buy it. Take the plastic off the cucumber, cut the very ends off, and then slice the cucumber in half lengthwise. 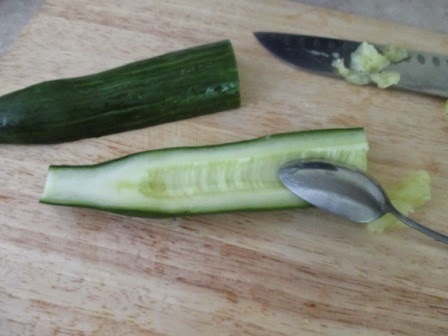 Using the regular spoon, scoop the seeds out by running the tip of the spoon down the length of the cucumber, trying to get as little of the cucumber flesh as possible. See the image below. Although the seeds are perfectly edible, I find removing them makes the salad less watery. Slice the cucumber as thinly as possible and dump it in the bowl with the tomatoes, onion, and olives (if using). In the jar or bottle, combine the lemon juice, olive oil, oregano, salt, pepper, and lemon zest (if using). Put the lid or cap on and shake well. Pour your dressing over the vegetables, and toss to coat. 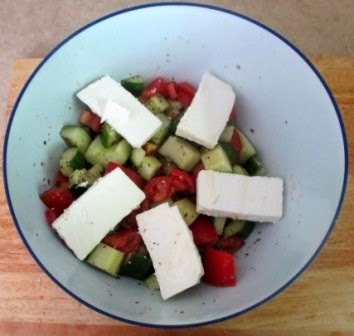 Cut the feta into squares or rectangles and put it on top of the salad. Drizzle with a little Olive Oil and you're ready to go! Serves at least 6 as a side dish, or 3 very hungry people as a main course. Next time I'll be looking at that French classic, Salad Niçoise! I taught you how to make original lettuce-based salads in the previous entry. Now let's look at the classics. Ever wondered what went into Salad Niçoise? Cobb? Greek? Potato? Caesar? Cole Slaw? Now's your chance! So read on! Potato salad is considered a staple at delicatessens and Canadian and American BBQs. I grew up with both my grandmother's recipe and that of Montreal Delis. 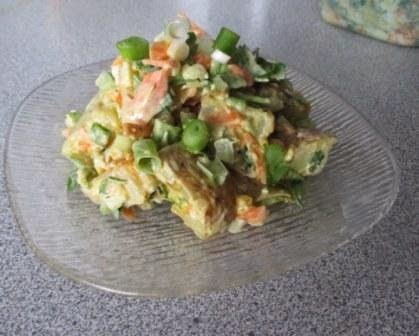 While not entirely the same, both versions of potato salad had more or less the same elements, namely potatoes, eggs, and a few grated and chopped crunchy vegetables followed by a mayonnaisey dressing to tie it all together. In my attempt to reverse engineer these famous recipes, I came up with the following. About 6 potatoes - you can buy potatoes bagged and already washed or unwashed - the former is sometimes a bit pricier but a convenient time saver, so it's really up to you - the type doesn't matter that much - some people prefer something starchy like a baking potato, while others prefer waxy like new potatoes - those smaller, clean looking, smooth skinned guys that are often served in fancy restaurants - if you want something somewhere in between, go with red skinned, white fleshed, or yellow fleshed potatoes. 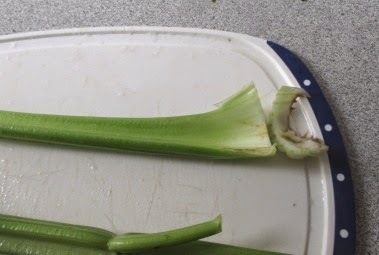 3 ribs aka stalks of celery - rinsed, the woody bit and the very end bit of the wider end sliced off, and chopped as finely as you can - I find the easiest way to do this is to carefully make slits along the length of the celery, and then slice as thinly as possible - see the images below. 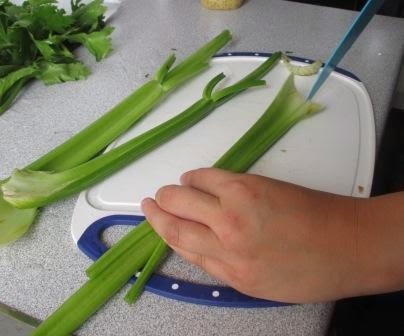 If the celery's freshly bought, and the leaves don't seem tough, you can use them as well as the stalks, but be sure to taste test the leaves before you add them to your salad. 4 or 5 Green Onions - rinsed, a half an inch from the green end cut off as well as the very end (the part with the roots) removed, and sliced as finely as you can. 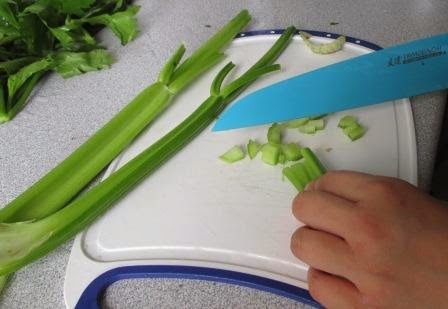 Green onions are usually sold in bunches of 6 or 7 - you'll need most of the bunch. 5 Hard Boiled Eggs - cooled in cold water, peeled and finely chopped - if you want to save time, you can always grate the eggs using your box grater instead. 1/4 cup to a 1/2 Cup of Finely chopped Fresh Herbs - Parsley and Italian Parsley (the flat leaf kind) are traditional and widely available, as is Dill - they can be found in the produce section of the grocery store and in fruit and vegetable stores, sold in large bunches for a buck or two. Can't decide which herb to try? Here's a quick guide: parsley tends to have a refreshing grassy taste, while Dill is has a more licorice/anise -y taste. The salad in the picture was made with flat leaf Italian parsley. Don't worry about what to do with the leftovers - I'll cover that in another article. 1 Tablespoon of Mustard - Dijon would be best, but you could use yellow mustard instead if you wish. Grainy mustard would also work too, but it may mess with the appearance of your salad. If you like the look of mustard seeds, go for it! If your potatoes didn't come already washed, wash them by running cold water over them and scrubbing them with a clean sponge. Though the traditional recipes contained peeled potatoes, you don't have to peel them. Not only does this save time, but a great doctor once told me that most of the nutrients in a potato can be found right under the peel. 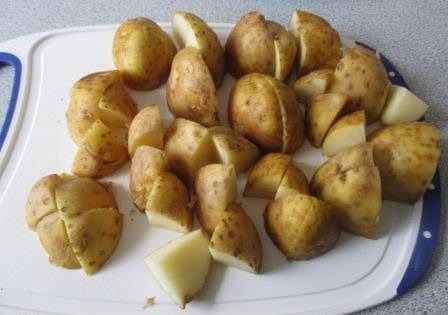 Cut the potatoes into 8ths and boil them until they're edible but not completely falling apart. The best way to test this is to pull a piece out of the boiling water using your trusty slotted spoon, blow on it a few times to cool it, and then taste it. When they're ready, pour the potatoes into a metal strainer to drain, and then dump them in your metal bowl. Cover the bowl with plastic wrap and cool the potatoes completely in your fridge. Slightly cold is ideal, but if you're in hurry, you can prep the salad when the potatoes are lukewarm. In separate bowl, mix the mayonnaise, mustard, paprika, salt and pepper. 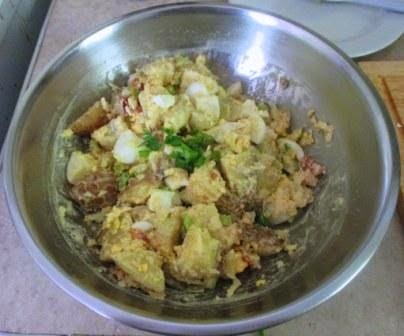 Add the eggs and half the dressing and mix to coat the potatoes. The yolks of the hardboiled eggs will fall apart and form part of the dressing. Toss in the carrots, green onions, celery, and herbs. Pour the remaining dressing into the bowl with the potatoes and other veg and toss or mix with a wooden spoon to coat. You are now ready to serve! Feeds 6 as a side dish or 3 very hungry people as a meal. This is a salad for people who don't like salad. Because contrary to the stereotype that salads are healthy, this salad isn't. It has all the unhealthy things that we love, and eating too much of it too often will probably give you a coronary. I came up with it watching one of those TV shows where chefs have to run around a given city and do a sort of culinary obstacle course. In the episode I saw, the chefs had to create new flavours for a popcorn stand. One of the chefs opted to take all the flavors of a baked potato and use them on the popcorn, and I found myself thinking: if the flavors work on popcorn and baked potatoes, why not serve them cold, in potato salad? So I mucked about in the kitchen, and this is what I came up with. Now before you balk at the ingredients, remember that this is heart attack potato salad, and that it has all but disappeared within an hour of my showing up at a BBQ with a bowl of it. 3 ribs aka stalks of celery - rinsed, the woody bit and the very end bit of the wider end sliced off, and chopped as finely as you can. 4 or 5 Green Onions - rinsed, a half an inch from the green end and the end with the roots cut off, and sliced as finely as you can. 5 Hard Boiled Eggs - cooled in cold water, peeled, and finely chopped - if you want to save time, you can always grate the eggs using your box grater instead. About a tablespoon of the bacon grease - Optional - it gives that extra richness and baconey flavor, but it isn't necessary. Prep and cool the potatoes the same way you would for the first potato salad recipe. In a regular bowl, mix the mayo, dijon mustard, bacon grease (if using), salt, pepper, and paprika. Add your eggs, and half the dressing and mix to coat. Dump in the chopped cooked bacon, green onions, cheddar cheese, celery, and the remaining dressing and give it a quick stir. You can now put it in the fridge for a day or two, or serve immediately. Stay tuned for next time, when I'll be tackling Greek Salad!